minue Slighly rephrased: "[W]hite is not a fool. He knows all of that which black knows." Me: "Give a kyu player solid territory, and if his opponent has only the most dubious of frameworks the player with cash in hand feels hocked to his eyeballs." From Charles Matthews in Teach Yourself Go: "Since the go stones don't move, it is worse to crowd them too close together, than to spread them too far apart. You can come back and defend where you are weak -- when you are stronger than necessary there is nothing to be done." BrainCore, regarding virtual sente: "[V]irtual virtual sente - 'wow, i could have [sworn] that move was virtual sente'"
There is a placement tesuji that seems special enough to warrant its own name. It can crop up anywhere on the board, but I see it most on the corner and on the edge. Dieter: It's coined as pulley by Tamsin. 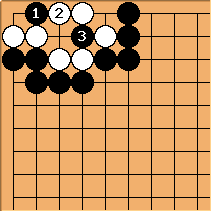 I use a go program for study and review offline, and play pretty much exclusively on KGS (strictly because of the quality of the user interface, it simply cannot be beat in my opinion). I sometimes run a version of Simple Go called "pybot" in the "Computer Go" room at KGS. Last count left me around 2d.